The 55-page transit improvement proposal would implement improvements to the bus system, in addition to a number of other large projects. A tax referendum goes to Nashville voters May 1. Nashville is now less than a month away from the start of early voting on its mass transit referendum. Voters will decide whether to raise four types of taxes to create a dedicated funding stream for a multi-billion-dollar overhaul to public transit. Two polls released in March show that many voters (potentially 34 percent) are still undecided or feel they don’t know enough about the plan to take a side. That’s despite a ramping up of messaging directed at voters by groups both for and against the proposal. As for the actual 55-page transit improvement program that will go in front of voters — it remains unchanged. WPLN will publish more stories about the referendum in the weeks before the vote. This post focuses on highlighting the key details. Bus enhancements (see the plan, page 11) would seek buses that run much more frequently, as well as longer hours. There would be new routes added — including crosstown paths that don’t flow through downtown, as most routes currently do — as well as four new rapid bus lines. The rapid buses would allow the drivers to trigger faster green lights at intersections, and it would create dedicated bus-only lanes in some areas, for efficiency. The much-discussed light rail lines connect to downtown from five directions — along Charlotte Avenue, Nolensville Pike, Murfreesboro Pike, Gallatin Pike and a northwest route along a former freight line near Tennessee State University. The routes range from 2 to nearly 9 miles. 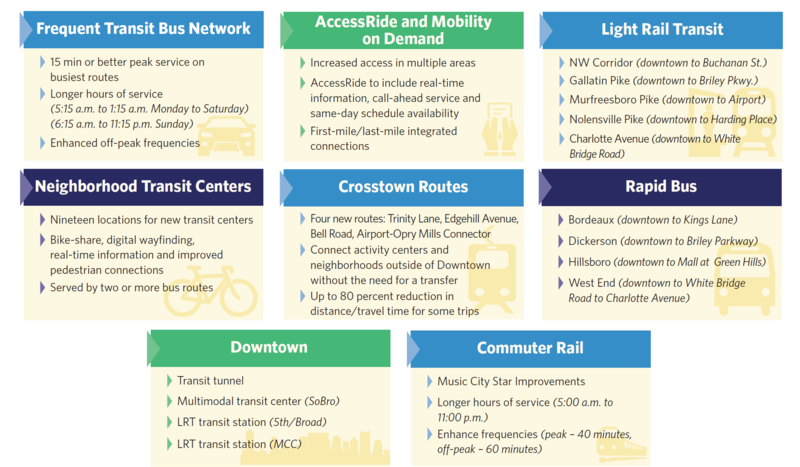 Adding together the four rapid bus routes, five light rail lines and the existing Music City Star commuter rail would make for 10 high-capacity routes branching out like spokes from downtown. The transit tunnel, which would be bored deep beneath downtown, is described in the plan as a route exclusive to trains and buses, providing a way to navigate the city’s busiest hub (plan pages 27 and 28). The program calls for 19 new “transit centers” across the city — including two in the tunnel — which would be more robust than current bus stop benches. This chart shows the transit proposal divided into eight sections. The plan also attaches numerous ripple effect benefits to the core mission, such as improving health and improving perceptions of the city as a friendly, accessible destination. But for each point in the plan, opponents have rebuttals. Among the common critiques is the proposal’s focus on light rail — which does not reach to the surrounding counties — and the anticipated disruption to daily life during years of construction. Some argue the proposal does not do enough for low-income Nashvillians, that the proposed tax increases are too big of an ask, and that the funds could be put to better use. Before the referendum was officially prepared for voters, policymakers argued over which price tag to attach to the brief wording on the ballot. This is what will appear in front of voters. At issue was whether to show a figure of $5.4 billion or $8.9 billion, and ultimately both numbers will be on the ballot. It’s more than $5.4 billion in capital costs to build everything in the plan — the road and rail projects and the new buses and trains and stations and stops. It's closer to $9 billion to do all of that construction and to operate the system for 15 years. Because Metro would issue bonds, the resulting debt service plan actually runs until 2060 and would require a total amount that is much greater. The largest share of the cost — 61 percent — pertains to the rail corridors (plan page 50). The strategy for paying these amounts is crucial to the plan. After the state legislature passed the IMPROVE Act, localities were allowed to dedicate portions of tax revenues explicitly to transit projects, and that’s what Metro is seeking to do. The plan asks voters to approve four tax increases: the local sales tax, hotel occupancy tax, business tax and local rental car tax (plan pages 39 through 43). The idea behind this funding method is to create a dedicated stream of money to support construction and continued operation of a transit system, although opponents have suggested alternatives. The plan estimates those tax revenues would account for 38 percent of the funding. Roughly 34 percent would be borrowed through bonds and 16 percent would come from federal funds. Sources like fares collected from riders would be one of the smallest funding sources. Early voting runs April 11-26, followed by the referendum on May 1. Voters must decide whether they support the 55-page plan and the tax increases that drive its financing strategy. If approved, that plan could not be significantly altered without council approval and an additional public vote — although many of the particulars, such as where individual transit stops would be located, are allowed to be determined later. Both sides in the debate over Nashville's proposed mass transit plan say the referendum scheduled for May 1 should go forward, despite Mayor Megan Barry's surprise announcement Tuesday that she's stepping down after pleading guilty to felony theft in connection with her extramarital affair. It’s official: Nashville voters will get the chance to decide whether to raise taxes to pay for the mayor’s plan for mass transit. The Metro Council finalized a referendum Tuesday night so that increases to four kinds of taxes will appear on the ballot on May 1.